Back in October of last year, I finally admitted to myself that I was ready to leave Manhattan. Well, that I was ready to start being ready to leave. Baby steps, you know? I created this grand Mental Plan involving quitting my job at the four-year mark and moving out to Chicago. The timeline for this Grand Mental Plan had me staying with my job through May 2012 and peacing out sometime this summer. But then I got laid off in December. So I adjusted my Mental Plan. I decided the universe didn’t want me to follow through with the plan and that I was meant to stay in New York City for another year. I got a new apartment and found a new job by the end of January and committed to spending 2012 right here in NYC. I even wrote an essay about the experience – that’s how well I convinced myself I’d be satisfied with the new direction my life was heading in. Anyway, I continued taking baby steps. The new apartment, new neighborhood, new roommate, new job and all that came with it? Those changes satiated my restlessness for, oh, about five or six weeks. My mind kept wandering, though. I felt that itch to leave, but this time it was even stronger than before. And when I let my mind wander, it didn’t go to Chicago. It went farther than I’ve allowed it to go – all the way to Los Angeles. So I created a new Mental Plan. I’d continue at my (new) job through the end of the year, finish out my lease, and then hopefully relocate and keep my job. I vocalized this plan to a close friend on Wednesday night, on March 28. The next morning, I posted this – alluding to a big life change that I couldn’t yet disclose. An hour later, I got laid off. Again. The world swam before my teary eyes; my head filled with cotton; I lost my footing once again as the floor was ripped out from under me. Panic set in as I felt myself floating through my life, again with no control over anything. I was relieved! I was freed from the ties keeping me here; I could do anything, go anywhere. Messages from the universe – fate, destiny, whatever you want to call it – are nothing more than your own perception of your circumstances. Sometimes, though, your perception of the circumstances aligns perfectly with that deep-down desire you’ve been too scared to act on. That’s what happened to me. I don’t believe I can be laid off from two different jobs in under four months and NOT create a life that is a total departure from the one I’m currently living. Mental Plans just goad the universe into challenging them; I feel like I’ve been dared to take the giant leap. Here’s the thing about baby steps that no one tells you: They don’t get you anywhere. They’re certainly safer and far less scary than a big jump, but even babies learn to run eventually. Most recently, Doniree compared it to ripping off a band-aid; there’s a mental disconnect between picking up your foot and actually leaping. Well, some of us learn important life lessons by pole dancing. I get laid off. Either way, I’m ripping off the band-aid, taking a giant leap forward, abandoning any pretense of having even a clue as to what I’m doing. I’m leaning into the utter terror I feel at uprooting the life I’ve known for years – and I’m moving to Los Angeles. In the four years I’ve lived in New York City, I’ve only ever had to kill a full-size disgusting cockroach once and it was after NYC basically flooded for three days so no one was that surprised. When I killed the roach (in a bath towl, dripping wet, with a 90-second spray of hairspray, BY THE WAY) I was shaken up. I felt gross and creeped out. But I was glad that nasty little giant thing was dead. 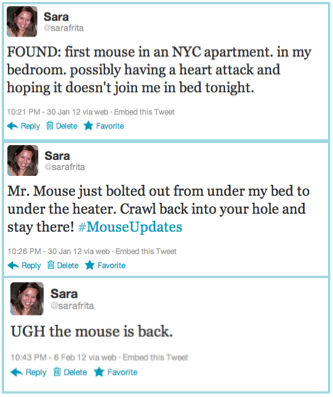 Recently, I tweeted that I saw a mouse in my bedroom. I saw the mouse once, and then twice, and then three times. After almost a full week of knowing there was a furry little rodent scampering around my bedroom, I emailed my landlord. He plugged up a hole under my radiator and set a trap in my bedroom. He set one in the kitchen, too, but that one’s still there. I know you know where this is going. Four days after he set the trap, I reclined onto my bed to have a chat with C on the phone. I leaned into my pillows, felt my muscles relax and then – I shrieked and hung up on C.
There, just under my radiator, was the back half of the furry little gray rodent. It was clearly dead. The trap worked. I should be happy, right? Not so much. I burst into what I call Girly Hysteria, but might better be likened to Kristen-Bell-with-a-sloth only on the TOTAL OPPOSITE END OF THE FEELINGS SPECTRUM. Big fat tears rolled down my face while I laughed maniacally. I curled up onto my bed, half crying, half laughing, rocking back and forth wrapped in blankets. I mean, I turned into a complete crazy person. Here’s the thing: I’m not scared of mice. Quite the opposite, actually: I had a pet rat when I was little! Her name was Squeaker and she was my very first pet that wasn’t a fish and I loved her so much. I blame Squeaker (and Adam’s rat, Nibbles) for my hysterics. All I could think of was how the mouse had suffered and how his potential family didn’t have him anymore! Really, those traps are terribly inhumane, but I am sane enough to realize I could not have a mouse just chillaxing under my heater/dresser/bed for all eternity. Boy-roommate was a remarkably good sport during this ordeal; I give him a lot of credit. He cleaned up the dead mouse even though he was totally grossed out and didn’t want to do it. He found my reaction hilarious, which made me laugh harder and cry less. So, after I spent three days eating no food and subsisting on crazy raw natural juices and doing yoga in the morning (seriously, who am I? ), I had to start eating again. For various valid and totally psychotic reasons, I actually didn’t really want to start eating again, but I knew I had to. Friday was a little rough, though. Work was crazy and I wasn’t really hungry, so I didn’t start eating till after 1pm. When I did start eating, it was a light salad, but the roof of my mouth got so irritated it became too painful to swallow. I ate the avocado and nothing else until evening. At that point, I could manage really small bites of a delicious homemade salad and it felt really good to eat something chewable and healthy. Saturday I got up feeling good once again (yay, lasting effects!) and went to the gym. I had an egg and toast and a banana and then went to Brooklyn to Skype with some Amazonian tea farmers. As you do. I made some mistakes Saturday evening though, as I became starving and went to a party and ate crackers and crab dip and shrimp cocktail and some French fries. Oh, and birthday cake. And wine. TALK ABOUT NAUSEA! Regrets. I should have known better, though. Eating smaller meals more frequently throughout the day is definitely something I’m going to be focusing on! I think that will curb my snacking urges and keep me full longer. Did I mention I lost seven pounds on this thing? Seven. Pounds. I obviously don’t expect it all to stay off, but wow! What an encouraging way to kickstart this get-healthy-lose-weight goal I’ve got! My tastebuds are super sensitive now. I’ve always been a good “taster,” but now everything is that much more intense. For example, I ate an olive on Friday night and almost cried at how salty it was. Speaking of salt, I’m going to be watching my sodium intake much more carefully now. I’m pretty sure that was a strong contributing factor to feeling like such a dead heavy slug and I’d like to avoid going back to that. Speaking of that dead heavy slug, I have also made the heartbreaking decision to stay away from milk-products altogether. I’ve been lactose intolerant to varying degrees for the past seven years or so, but sneaking in some cheese has never affected me too much. Or so I thought. Going the past week with absolutely no dairy has made a world of difference. Speaking of cheese, IT’S IN EVERYTHING I WANT TO EAT. This is why I had to sneak cheese all these years despite knowing my body doesn’t like digesting it! Seriously, everywhere I look, it’s gruyere-this, cheddar-that, swiss-this, pepperjack-that. Screw you, cheese! I love you but now I hate you for taunting me with your gooey deliciousness. In conclusion, I’m sad about the cheese. Really sad. Everyone have some extra cheese today for me. In final conclusion, this cleanse was awesome for me overall, if not tragic for my cheese consumption. That juice diet everyone’s talking about? I did it, too. As you all know, I decided to jump on the oh-so-trendy cleanse bandwagon with the BluePrint Cleanse. I’ve been wanting to try it for a long time, although various factors prevented me from diving into the 3-Day Juice Diet. Factors like social plans, money or lack thereof, and, of course, my propensity for chewing. My reasoning was this: Everyone cool is doing it. Ok, fine, that was only part of my reasoning. In all seriousness, I’d been feeling especially gross and lethargic and full of buffalo chicken dip (Hi, Superbowl! Go Giants! Boo hot sauce and sodium!). I mean, I was just feeling puffy. And tired. So tired. So I went with the obvious solution and decided I may as well stop eating solids for 3 days to see what would happen. Juice #1: the Green Juice. This literally tastes like drinking a salad. Kind of a sweet, lots of lettuce and nothing else salad. It was actually really refreshing to have first thing in the morning, although I wouldn’t say it tasted good. It tasted clean, though, which was the point. I loved Juice #2, the Pineapple Apple Mint, which everyone says tastes like a mojito. It really does. What a nice mid-morning treat! Juice #3 was Green Juice again, which was so hard to choke down. One of those per day is fine by me, anything more and I’m on Liquid Salad Overdose. I was really excited to try Juice #5, the Red Juice. It’s made mostly of carrots, beets, apples, and ginger. I love beets and I’d heard that that was the key to liking this juice. Alas, all I tasted was the ginger. So ginger-y! So sweet and ginger-y! It actually felt like my mouth was puckering with each sip. Definitely my least favorite juice by far. Juice #6 gets a lot of hype; lots of people call it a liquid cookie. Let me go one step further: This “juice” is a liquid snickerdoodle cookie. It’s cashew milk with cinnamon and vanilla and it is delicious. I kind of want some right now. Day one I woke up feeling like a heavy slug. Only a dead heavy slug, since they die when you pour salt on them and that’s pretty much all I’d been pouring down my gullet. Day two I woke up feeling fantastic. I was alert and I felt light and clean. No more Sluggy Sara here! Day three I woke up and went to yoga! I hardly recognized myself! I felt so energized and the workout was great. Usually morning workouts are hard for me because I’m such a heavy dead slug that I don’t really push myself. Each night I fell asleep between 10 and 10:30pm. Boy-roommate judged a little, but I slept great! The juices were a little boring the first day. I struggled to get them down and I thought about food a lot. Not enough to cheat, though. Dropping two hundo on some juices will kind of force you into commitment, ya know? Day two was definitely the best. I took a spinning class that evening and I swear I sweated out toxins. Day three I struggled to finish the juices. It was just so much liquid; I could tell my stomach had shrunk. Speaking of so much liquid, over the course of each day, I was also drinking a lot of lemon tea and a lot of water and I kept peeing. Luckily, I didn’t wear heels so at least I didn’t have to clack across the wooden floors at work every 20 minutes to get to the bathroom. Subtlety is key for me. The main complaint I had was that the juices tasted really sugary. I know they are totally natural, so any sugary-ness is also totally natural, but it actually made them harder to drink. Also, my teeth got fuzzy mid-day, which required some awkward public-bathroom-teeth-brushing. Overall, I was never actually hungry. I didn’t get light-headed and my blood sugar didn’t plummet or spike. After the first day, thinking about food was sort of tangential, which made me feel kind of superior to everyone else taking real bites. But wait, you might say, what about now? What happened when you starting eating real good again? Did you lose weight? And that, my friend, will come tomorrow with its own post!